25 - 2 1/4 x 4" Variety Blank Rolled Scrolls | Blank Scrolls | Scrolls Unlimited, Inc. Need some Blank Rolled Scrolls for an event, school or church project? These are perfect at a discounted price. 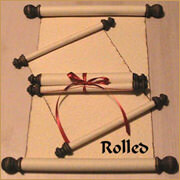 These scrolls come only in a variety of colors of our choice and are not tied with a ribbon.